KANSAS CITY, Mo. -- A homeless man posed for photos with his dead wife, along with their newborn and toddler, before dismembering her body in a Kansas City hotel room, according to court records. 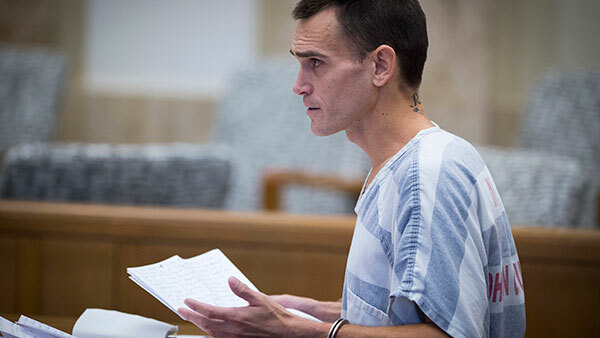 Justin Rey, 35, who was arrested last month after being found with the remains at a Kansas storage unit, was charged Wednesday with abandonment of a corpse and child endangerment in Jackson County, Missouri. He's jailed on $1 million bond in Johnson County, Kansas, on child endangerment charges. Rey told police that his wife, Jessica Monteiro Rey, died after giving birth Oct. 20 and that he dismembered her body in a bathtub two days later with the children present. Rey put some of her body parts in a large cooler, a Kansas City police detective wrote in the probable cause statement. He used a stove to boil parts that wouldn't fit in the cooler and flushed some of remains down the toilet, the statement says. Hotel management said Rey tried to disguise his voice as a woman's when he called the front desk to check out on Oct. 23, the statement says. Surveillance video footage shows him pulling a red cooler with a black bag on top through the hotel, while pushing a stroller with a toddler walking beside him. Police found the remains on Oct. 24 inside a cooler and tote at a U-Haul Moving and Storage facility in nearby Lenexa, Kansas, after Rey slept there with the children. Emergency responders checked on the children, who were later taken to a hospital. The affidavit says the baby wasn't wearing adequate clothing and had an eye infection. After Rey was arrested and put in a police vehicle, he was asked about his wife's whereabouts. He responded that she had died several days earlier and was in the cooler and one of the totes, which he had been trying to remove from the storage unit, according to Kansas court records. The probable cause statement for the Missouri charges says the hotel room's bathtub drain was removed and apparent human tissue was found. Traces of blood also were detected throughout the room. Missouri and Kansas court records don't say how she died, and Rey provided conflicting information. Rey said that his wife committed suicide after giving birth and also that she died during or after childbirth, the probable cause statement says. Rey had a series of run-ins with the law in the northwestern Arizona communities of Lake Havasu City, Kingman, Williams and Flagstaff between 2012 and last December for relatively minor offenses. Court records show eight cases, including four for theft and a pair of citations for driving without a valid license and insurance and a probation violation case. The records show he pleaded guilty in five cases and mainly faced fines, while two others were dismissed. He never served time in an Arizona state prison. Rey's attorney in the Kansas case, Courtney Henderson, did not return a call from The Associated Press seeking comment early Thursday. Rey doesn't yet have an attorney in the Missouri case.